A reader writes to tell me they met the venerable Madame Martin, widow of Frank Martin, at a performance of the composer's opera Der Sturm at the Concertgebouw in Amsterdam yesterday. Martin is a neglected figure who was a teacher of Stockhausen for a short period. I wrote about him here last year and singled out his little known Requiem from 1972 for attention. We can only speculate how different Martin's reputation would be today had the Swiss-born composer lived the last twenty-eight years of his life in America instead of Holland. 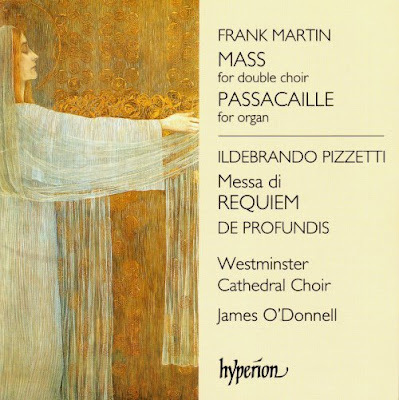 If Frank Martin is remembered at all today it is for his choral music, and the Mass for double choir in particular, which features in my header image. 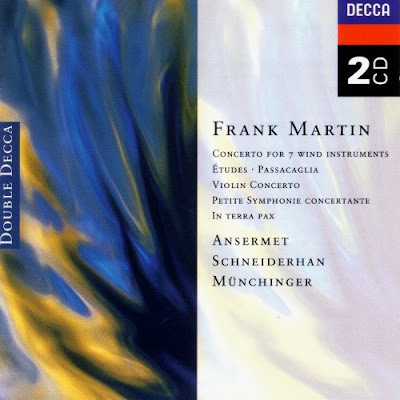 But there is some very fine orchestral music which is collected on the Decca 2CD compilation seen below together with his oratorio In Terra Pax. If your musical tastes favour tonality (and there is nothing wrong with that) but you want to explore the lacuna in twentieth century music where tonality met serialism this budget double CD is recommended. Wonderful playing from such great names as Karl Münchinger, Ernest Ansermet, L'Orchestre de la Suisse Romande and Stuttgart Chamber Orchestra. The analogue sound is quite stunning, just listen to the crisp attack of the Suisse Romande players in the wind concerto. I am not going to say anything more about the sound for fear of putting off the many dedicated followers of digital fashion, but just let me say it isn't stereo. By sheer coincidence I saw details this week of a concert which the excellent Keswick Hall Choir is giving in Norwich Cathedral on February 28, 2009. Here is the exquisite programme, and many congratulations to the choir for not succumbing to a Rutter Requiem to put bottoms on seats in the cathedral. There is a video of the final scene of Der Sturm with sound from Frank Martin's own recording with the Berlin Philharmonic and Dietrich Fischer-Dieskau on YouTube. More on the Keswich Hall Choir in Master Tallis' Testament. I am, in a small way, a collector of requiems. At last count, I think I had 25 different composers' works in my collection. I will certainly have to look up Martin's as well. The Duruflé is just amazing music all around. I rotates up there with the Levin reconstruction of the Mozart, and the Verdi, for the place of honor as "My Favorite Requiem." I worked with a lady a long time ago who, when asked what her hobby was, replied 'requiems in a minor key'. There are worse hobbies to have, certainly! I am curious to know what your favorite reconstruction of the Mozart might be, if you've ever put any thought into the question. Unfashionably Süssmayr. Pragmatically, because I'm old enough to have learnt to love the Mozart Requiem from Colin Davis' 1967 recording which uses the Süssmayr completion. Practically, because to reconstruct you have to first deconstruct what is Mozart and what is Süssmayr. It appears that is very difficult as Süssmayr destroyed some of the composer's original sketches. But I'm a blogger, not a musicologist. So I'm happy to bow to superior scholarship on that one. And, by complete coincidence, there is a very unreconstructed Mass on tomorrow's path - in two hours to be precise. Well, the Suessmayr was the first I was familiar with, and I can listen to it with fondness. However, I cannot bring myself to think of it as Mozart, as it, to my ear, PLODS. I was impressed with the study and work Levin put into his. There were new bits and pieces discovered on which he did base a good deal of his work, and I believe that (most) of the liberties he took are well-reasoned. The biggest reason I like it, honestly, is that when I turn it on after listening to something that is FULLY Mozart's, it is much harder to tell the difference. It has some of the life and verve that Wolfie seemed to inject even into his most somber works. I'm looking forward to tomorrow's post! You have me extremely curious as to what it might be.